There are plenty of interesting services that take links as input and do useful things with them. Good example are services for improving readability of pages. Piping page through such service is rarely streamlined and requires copy/pasting link or using bookmarklet. Clunky. 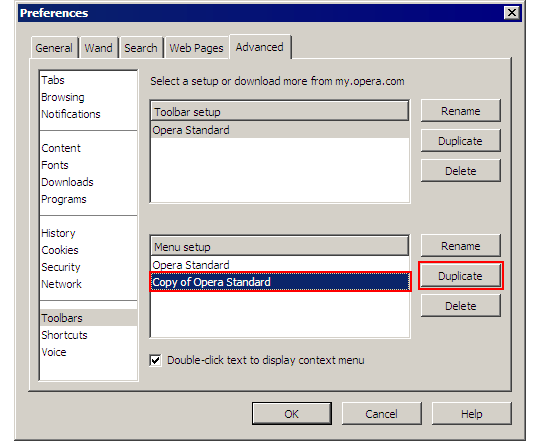 So here is how to modify Opera to open links in services from context menu. Menus in Opera may seem rigid but they actually are (like rest of interface) very flexible and relatively easy to modify. Opera stores default menu settings in defaults\standard_menu.ini. To start modifying that one must be overridden with menu file in profile folder. instruct browser to open resulting link. Context menu is one of the most basic and convenient ways to perform actions related to element. Editing context menus may not be most user friendly but it is powerful feature that can save a lot of time and clicks. By the way if you want to provide custom menus for all users in centralized way check post about Opera super setup. Please rephrase? I have no idea what you wanted me to explain. At least for linux, you don’t need to restart opera, you only need to give “OK” to a different set of shortcuts, then select the modified again, and give “OK” to it. Probably the same works with windows too. Anyone knows how to make a menu entry for links that would open images, each in one tab, and then save each one? That’s to save time when downloading images from blogspot blogs through links. If you try to save the links, it will actually save 403 pages, but it won’t if they’re actually opened. I do not know easy way to do that and from your description it seems that site actively tries to prevent leeching as well. The only trick I can suggest here is Ctrl+click image for rapid save dialog. I think that there’s no way to do that with opera, but maybe there is, if only someone knows how to “program” those menu actions properly, and is interested in achieving that, which is not really that useful anyway. The best thing to solve what I said is either do as you said, or use firefox and an extension that allows that (I don’t remember its name now), which will download even the big images from blogspot, somehow. I do not know many english words (my own language is not english and mey memory is poor too) and often look dictionary with copy paste for that reason. Thanks again, good days and works. What abaut nasty icon addons placement in Opera ? If you have some addons installed then you have the problem ! Why not move the icons to some tollbar or even better integrate to context menu under icon last closed pages ! Its realy anoying and nasty ! Yeah, extension icons are quite annoying and inflexible, comparing to rest of Opera’s interface. There is new major release (version 12) in development and I hope it gets improved there.